Luke Skywalker was a legendary war hero and Jedi who helped defeat the Galactic Empire in the Galactic Civil War and helped found the New Republic, as well as the New Jedi Order. Born in 19 BBY as the son of the fallen Jedi Knight Anakin Skywalker and the Queen and Senator of Naboo, Padmé Amidala. Luke was raised on Tatooine and hidden from Emperor Palpatine and his father, who had recently become Darth Vader, Dark Lord of the Sith. In 0 BBY, Skywalker’s life changed forever. A chance purchase of two droids, R2-D2 and C-3PO, led to him to receive training in the ways of the Force from Jedi Master Obi-Wan Kenobi and to meet Han Solo, and Princess Leia Organa, who was, unbeknownst to him, his twin sister. 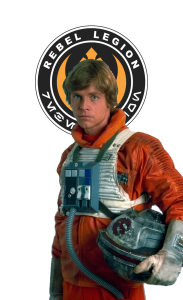 Skywalker then destroyed the first Death Star and joined the Rebel Alliance. 1. Orange flight suit with altered collar. 2. Orange flight jacket with rank insignia on LH pocket, puffy collar, zip front , hip level length, & ribbed sleeves. 4. Brown holster with octagonal buckle with leg strap around right leg. 5. Lightsaber D-ring hook on front of belt so lightsaber hangs down front of left leg & either 2 or 3 regular pouches. 6. White flak vest with ribbing. 7. Grey chest box with grey hose OR aviation hose and appropriate decoration (buttons, pin stripes etc.) . 8. X-Wing helmet with Luke’s decals. 9. White/off white leather gloves with suede gauntlets and Comm Pad on left wrist. 10. Leg pockets on coveralls . 11. Grey suede boots with suede wraps around them and 3 white straps. 12. Characters’ hair needs to be a “similar” style to that of Luke Skywalkers’- no buzz cuts or beards also.